I have been using self-drive rentals since a decade now and keep a close eye on various developments in this industry. While I have regularly written about various self-drive agencies, their policies, pricing and vehicles, the agencies also keep changing their policies to stay competitive and keep adding new cars to their fleet. So it is a continuous learning process to stay updated. The self-drive concept has now been fully recognized and accepted, unlike a decade ago. More and more people are realizing the advantage of not owning a car and being able to rent one on need basis. That is really a good sign and ensures good prospect for the industry. Zoomcar fuel included, Revv- fuel extra. No need to worry about Fuel Economy - can run full AC or sleep in car with Engine n AC running, since only kms on the odo count. - If you can drive economically, you save more with Revv as fuel cost will be lower. Zoomcar pricing doesn’t care how you drive. - In most cases you will not be using the exact km- if you drive less than the plan, you save a lot on fuel with Revv. - In case of long drives, you have to fill up zoomcar on your own, submit the bills and wait for reimbursement in addition to paying excess 15 Rs per kms, spend effort on follow up etc. This is unnecessary hassle in my opinion- many social media complaints suggest delay in processing, causing extra follow up time and frustration to customers. Revv policy is simpler and less headache. You’ll usually get a decent car, but a bit of luck is involved as each car in the fleet can be of different age and condition. Hard to predict. Revv is the clear winner in this case. This could be because they’re relatively newer and their cars are also newer, but on two separate occasions they’ve delivered low odo reading cars which were maintained well. Zoomcar has been around for several years now- if you book models which were around for long time- like Figo, Scorpio etc, chances are high that you will get a few year old car. You can check on their social media platforms to know if there’s any new model introduced- if so you are likely to get new car. Customer care team I spoke with at Revv was very courteous and the car was delivered without any problems. 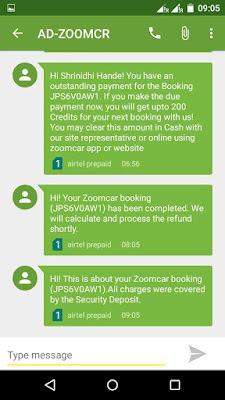 During initial days, connecting to Zoomcar customer service was easier. Now lots of IVR options and navigation before you can speak to a real human being. 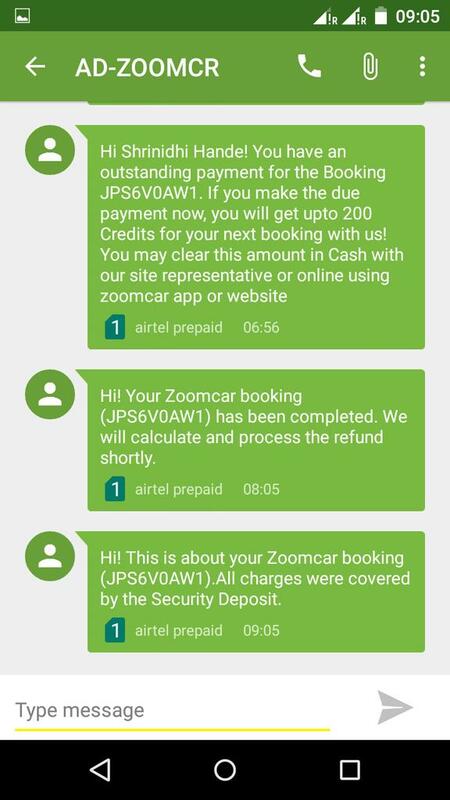 On the day of my return, got an SMS from Zoomcar that if I return the car full tank, I will be given Rs 500 credit + reimbursement. I wasn’t keen on it, so I ignored it. As I returned the car and left the building, I got an SMS stating there was outstanding payment on my booking- I had not violated speed limit, I had not cross km limit, so I was not sure what is this outstanding. An hour later another SMS said they are processing my refund. This was followed by one more SMS stating everything is fine (no outstanding, no refund)- Not sure why I am subjected to all these conflicting SMSs. Zoom can take its time and send a final SMS instead of multiple conflicting updates. Conclusion: Both companies now offer similar models (with, without fuel), subscription models and so on. Because I am used to Zoom I tend to rely on them more, despite some negative publicity going around. I am waiting for Honda City 2017 to launch, do not know the price of Honda City car is how much? Are there any promotions this month? We are renting a XUV for 4 full days with Revv and the total cost is coming up around 13K excluding deposit. We will use it for 600 to 700 kms max. Will Revv work or Zoom or Myles are better options here?